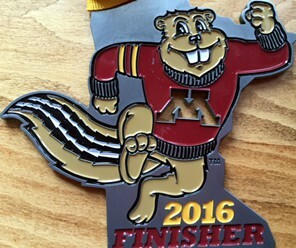 I signed up for Goldy’s 10 mile run three weeks ago to get myself moving on training again. It’s one of my favorite spring runs, weaving through the University of Minnesota campus and along the Mississippi river. While we’ve had an early spring, winter temperatures returned today with 20 degrees at start time. For my first long event of the season, I felt pretty good. At mile 9, I stopped for one last cup of water at the water stop before pouring it on strong for the last mile. As I turned to start out again, the water that had spilled on the ground during the morning had frozen and I wiped out, hard. If being judged in a competition for falling, this would be a 10 out of 10 for execution, style, sliding distance and landing. A solid wipe out. After I dragged myself up, I started out walking slowly and limping a bit. After a few blocks I started into a jog, limp, skip pattern for a few more blocks until I started getting into the groove again. As I walked away from the finish line, a young guy came up to me to tell me that he saw me fall and that I was an inspiration for getting up and finishing. I smiled wide and thanked him for the encouragement. Take the time to say a kind word of encouragement to someone every chance you get. He didn’t have to say anything but he did. It made my day and reminded me of the power of words and actions. I’m not the fastest runner and won’t be winning any races anytime soon, or ever. I am happy to still participate, finish and push myself to stay in the game. On my 51st year in this world, I would still rather participate than spectate. Do things that challenge and even scare you a bit. You can do more than you think so start, and finish. Life is so much more than successes and victories. It’s about how we get up and that we get up when we fall. Never give up and keep getting up, every single time. Last lesson, water freezes and pavement is hard. Participate, persist, persevere and show kindness. Thanks Goldy, good class today. Great job, signing up for, participating in and finishing the run! Staying in the game is sometimes hard to do. Your post today inspired me and reminded me of the times I’ve fallen, gotten back up and experienced the joy of “staying in the game”. Have a great week!! Thanks and keep getting up and stay in the game. The only way to live.